Toyota introduced the 2.4L 2AZ-FE engine in 2000 as a replacement for the outdated 2.2L 5S-FE engine. The 2AZ-FE used advanced features to improve efficiency and reliability. Unfortunately, this engine does have the same cult following that the 1UZ, 1JZ, and 2JZ have, but it’s still a cool little engine. The 2AZ-FE uses an all aluminum block design with cast iron cylinder liners to help save weight which was important for the economy-focused vehicles it was designed for. Toyota also used an aluminum cylinder head with a DOHC design to improve power and efficiency. This engine also featured advanced technologies such as; slant-squish combustion chambers, offset cylinder and crank center, and Toyota’s variable valve timing system, VVT-i. The cylinder block uses an open deck design to improve the cooling system’s efficiency. Later versions of this engine used Toyota’s direct injection system to further improve efficiency and power output. Some of the later engines even bumped the compression ratio all the way up to 12.5:1 with the help of an Atkinson cycle design. The 2AZ-FE was equipped in various automobiles ranging from sedans, coupes, and small SUVs. Toyota did this because of initial success and efficiency of this little engine. Unfortunately, later down the line, a large issue with this engine in the 2007-2009 Camry came to light which lowered the resale value of those vehicles. 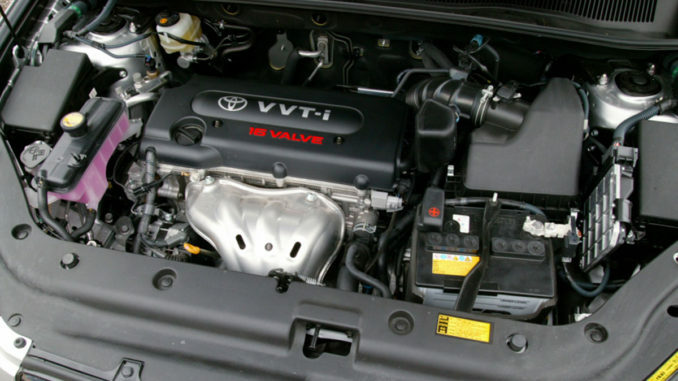 Like we mentioned above, a large issue came to light with this engine in the 2007-2009 Camry as well as other vehicles. This issue was extremely excessive oil burning. This issue forced Toyota to offer free inspections to determine if your engine was affected by this issue. Most vehicles affected by this issue will burn over a quart of oil every 1,200 miles. Around 1.7 million vehicles are covered by Toyota’s inspection. The component that causes this massive issue are the piston rings. Another known issue that can cause excessive oil burning is the cylinder head bolts. Some of the bolts are known the slowly thread out of the aluminum block and cause head light. Unlike four-cylinder from Honda or Ford, Toyota’s four-cylinder engines generally aren’t modified. Their engines are designed solely for efficiency and really nothing more. The 2AZ-FE in the Scion tC had an optional supercharger which raised power output to around 250 horsepower. The 2AZ-FE does feature piston oil squirters which is a very nice feature to have when forced induction is introduced to an engine. The pistons are the first component to fail when increasing power. With an aftermarket bottom end and a larger supercharger, the little 2AZ-FE can reach up to 400+ horsepower. A stock TRD supercharger will improve the 1/4 mile of a Scion tC from 15.7 seconds to 15.1 seconds. Although that’s still relatively slow, it isn’t that bad for an economy based coupe. The FSE version of the 2AZ features Toyota’s direct injection system, combined with a higher compression ratio the power output was increased to 161 horsepower and 170 lb-ft. This version of the 2AZ didn’t see much use and was only installed in the Toyota Avensis. To further push the boundaries of this little four-cylinder Toyota developed a special version just for their hybrid electric vehicles. This version, known as the 2AZ-FXE, used an Atkinson cycle design which allowed for a 12.5:1 compression ratio. The Atkinson design reduces total power output but greatly increases efficiency. This version of the 2AZ when combined with an electric motor outputs 211 horsepower and 108 lb-ft. This version was used in the Alphrad hybrid, Estima hybrid, Camry hybrid, HS 250h, and the Toyota Sai. If you’re still craving more information check out this 2AZ Wikipedia article. I have made a modification to my camry 2009 car with 2.4 2AZ-FE 4 cylinder engine. The modification has done to the engine to produce more torque for the same fuel consumption. Although, there is a mismatch between the engine (after modification) with the automatic transmission, it reduced the fuel consumption by 30% (combined High way and city). Is the is any way to tune the automatic transmission to align with the increased engine torque?